The Luna Lullaby Lil Something is a perfect solution for a compact, travel-friendly nursing pillow. The cover is super soft, with a fleece-like material, that mom and baby alike will enjoy snuggling into. The L-shape design makes it a good choice for moms (and dads) of different shapes and sizes. Unfortunately, this option can be a bit too soft for younger infants, as they tend to roll towards mom. As the baby grows and gains more head and neck control, this issue resolves itself but the first few months can be a struggle. It is also on the small side and may not meet the needs of some users for an everyday pillow. Overall, this is an affordable and comfortable choice you can use after your nursing days are over. Luna Lullaby solely manufacturers nursing pillows and covers. Their mission is to instill confidence in new parents with the ability to soothe and comfort their babies after they experienced personal struggles with their babies. They consulted with childcare experts, researched, and Luna Lullaby was born. All of the pillows are manufactured in the USA. The L-shape design of the Luna Lullaby Lil Something makes it easy to fit on different shape bodies. This Luna pillow is a small compact option good for on-the-go nursing where a traditionally sized pillow may not be feasible. We love the compact, yet effective design of the Luna Lullaby Lil Something. The Lil Something has soft, minky material that is comfortable against the skin and a nice compact shape that makes it easy to nurse in chairs, beds, and almost anywhere. However, the pillow is so soft that feeding younger infants can be an issue. The soft nature of the pillow can result in babies rolling into you. This issue can create a need for multiple repositionings during a single feed. This issue usually gets better as the baby gets older and has more head and neck control. The travel friendly design of the Luna Lullaby Lil Something makes it easy to nurse when out and about. The compact L-shape design makes the Lil Something more compatible for parents with different shaped bodies, compared to the Luna Lullaby Bosom Baby. The sides of the Bosom Baby extend so far that it can be cumbersome instead fo comfortable. This problem is avoided with the Lil Something thanks to a lightweight, effective design. The smaller size makes it perfect for nursing in a variety of chairs and to bring along on outings, as it can easily fit in the bottom of your stroller or keep in the back of the car. It is also perfect for tummy time, or as a comfortable pillow to rest your head in the car. The plush cover of the Luna Lullaby Lil Something is so cozy you may want to snuggle with it, even when you are finished nursing. The cover on the Lil Something is a super soft synthetic material that almost feels fleece-like. It's cozy against mom and baby's skin, but the downside is the material can get hot and make everyone a bit sweaty if you utilize it in warmer weather. With no hardware to deal with, the cover of the Luna Lullaby Lil Something has an extra fold that opens easily when it needs to be washed. Removing the cover of the Lil Something is easy with no zippers or fasteners. The cover folds over itself, making it simple to open and slip the pillow out. The cover is machine washable, but the pillow itself is not, so you'll want to remove the cover as quickly as possible after any mess to avoid it hitting the pillow. The cover needs to be line dried which is a bummer and means you'll need to use the pillow without the cover if your little one needs to feed while the cover dries. Once the cover is dry, it only takes a minute to reassemble. Also included in our review, is the Luna Lullaby Bosom Baby. Depending on your needs or goals, this larger pillow could be a better choice for everyday feedings in your home. Amazon $24.00 - 11% off! *You help support BabyGearLab's product testing and reviews by purchasing from our retail partners. 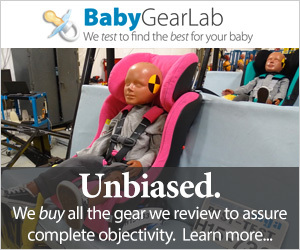 How can we improve BabyGearLab? Got feedback? BabyGearLab is reader-supported. When you click on links to buy products we may earn money to support our work. Learn why millions of parents trust our reviews on our About page.